House colors are deep purple and dark gray. Purple is the color of royalty and wealth, the deep colors that emerge from sunset and the color of Marie Laveau’s hypnotic eyes. Gray is the color of twilight, of the in-between spaces of dusk and dawn, a mixture of light and dark that some say is an absence of color, but is a palette for Laveau to work with. In voodoo, the deep purple is recognized for power, psychic abilities, and contact with the spiritual world, a very useful color for seances and necromantic rituals. The ivy on the crest represents tenacity. There is a dual nature to ivy: it is beautiful and useful, to control erosion for example, or to train and prune into artful shapes. Like Laveau members, ivy is not something to be underestimated or to ignore. What starts as the tentative embrace of a tiny tendril can transform into the clinging claws of a choking vine that is difficult to control. Laveau herself was a powerful artificier (art-ih-fish-ee-er), and house members in particular use this French spelling and pronunciation, both as homage to Laveau and as a philosophical differentiation from those who craft objects based merely on their function and not their artistry. Artificiers believe in both form and function, and that the most powerful objects also have an aesthetic, and that the aesthetic itself adds magical power to the artifact. It’s believed that Laveau did not teach her students her most powerful artifact creation techniques, and many house members strive to discover or reverse engineer her secrets. The house motto is, “With Mind and Skill,” speaking to a combination of theoretical and practical knowledge. As master artificier and artisan, Laveau felt that those two values were the only ones of importance, and held contempt for those who advocated for creating with prudence or restraint. 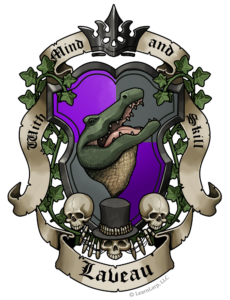 The skulls on the crest are for death, merely another state of reality according to Laveau, and not something to be feared or prevented. “Show me the dark places and there I will dance,” Laveau is reported to have said with a smile, and house members do not fear the unknown, unexplored, or what lies beyond. Laveau hand-picked students with exceptional intelligence, skill, creativity, tenacity, and a willingness to take risks. Laveau possessed great magical powers and knowledge of arcane lore, and was both feared for her prowess and revered as a wise wizard with a strong connection to the spiritual world. It is said that she created a potion made from vampire’s blood that keeps her eternally youthful and beautiful. She spoke four languages: English, French, Spanish, and Creole, and was considered the foremost authority on relics, bonded objects, numerology, and controlling the inanimate. She was a very successful businesswoman who commanded considerable wealth in both mundane currency and Leeuwendaalders. As a potent artificier, she was consulted by mages of all traditions, sometimes for dark or dubious purposes, such as to regain a lost lover, to take a new lover, to eliminate a business partner, or to destroy an enemy. She frequently hexed hairpins, which she would use in the elaborate updos that she was known for among her clientele. Laveau herself had a beautiful cloisonné hair comb that allowed her to see through the eyes of another, living or dead. Her love potions and talismans were legendary as well, and she was often consulted for matters of the heart. Among Laveau’s interesting theories was that wizards are themselves artifacts, and that artificiers in particular are compelled to continually improve themselves in order to become an evolving self-aware artifact. House members often bristle at lessons that appear to teach material that’s already known or won’t provide any measurable improvement of their skills as wizards. Others sometimes view this attitude as recklessness or arrogance, though usually from a safe distance.